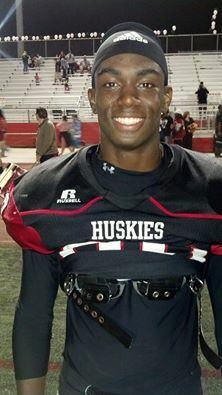 Javon McKinley had six catches for 154 yards and three TDs in the CIF-State title game, and finished with 96 receptions for 26 TDs and more than 2,000 receiving yards in 2014. No player has ever had a playoffs quite like Javon McKinley. His was nothing short of epic. Corona Centennial’s 6-foot-4 receiver dominated the PAC-5’s best defensive backs, getting better with each game until the Huskies reached the CIF-State title game — the big kahuna — vs. Concord De La Salle. “He’s played great this year. Up and beyond expectation,” Centennial head coach Matt Logan said. To say he’s a college recruit is an understatement. He’s among the most sought-after wide outs in the country, would be welcomed anywhere with his 4.0 GPA, and is FOMB’s 2014 Inland Area Prep Football Player Of The Year. But McKinley’s legend may have begun in Week 11 when he had a season-high 14 receptions for 240 yards and four TDs in the PAC-5 playoff opener vs. Gardena Serra. Then it was six catches for 187 yards and one TD in a narrow win over Santa Ana Mater Dei, followed by 11 grabs for 282 yards and three TDs to beat La Puente Bishop Amat in the semifinals. And what does McKinley do in the CIF-Southern Section title game? Just make 13 catches for 151 yards and one TD in a crazy 48-41 win over over Bellflower St. John Bosco in the section final. Over the four-game stretch he had 44 catches for 860 yards and nine TDs. And that was following a regular season in which he finished with 47 grabs and more than 1,200 yards and 11 touchdowns for the Big VIII League champion. I caught up with McKinley following Centennial’s 41-9 victory over Riverside King on Oct. 10, 2014. He had had nine receptions for 162 yards and four TDs in Week 5 vs. Valencia, and made six grabs for 147 yards and two TDs in Week 6 vs. King. As they usually do, the Huskies (12-3 overall) had started slowly against King, allowing the Wolves just a twinge of hope before crushing them completely for the umpteenth time in the league opener for both teams. “I think it’s just — coaches said we start off slow against King — and that really showed tonight. We picked it up at the end of the second quarter and in the second half,” said McKinley, already a polished post-game performer as well. And just early October, McKinley already was interested in talking about the Huskies’ postseason possibilities. “Hopefully we make a run for the money and so our thing against the PAC-5,” he said. A 16-year-old junior, there’s little way around a conversation regarding his impending value. He could end up as many things, including Centennial’s most-recruited player to date. Goals No. 1 & No. 2 have been accomplished. Goal No. 3 is all No. 88. Norco AD Cameron To Be Fired?